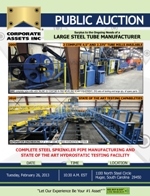 Corporate Assets Inc. | Large Steel Tube Manufacturer - Corporate Assets Inc. COMPLETE STEEL SPRINKLER PIPE MANUFACTURING AND STATE OF THE ART HYDROSTATIC TESTING FACILITY FEATURING: DMC (2000) 4.5" x .237" tube mill; DMC (2000) 2.375" x .188" tube mill; large qty. of tooling sets for rounds, squares, rectangles and scarf removal equipment; AUTOMATION ENGINEERING (2010) HYDROSTATIC AUTOMATIC TUBE TESTER with 0.5"-4.0" OD, 17ft-34ft length cap. ; HAVEN (2002) TUBE RE-CUT SAW & DEBURRING LINE with 0.5" to 3.0" OD cap., HYD-MECH S25A automatic horizontal band saw; (2) VICTAULIC VE 268 pipe roll groovers; JD SQUARED 32 tube bender; P&H 30 ton overhead bridge crane with 40 ft span; (2) P&H 5 ton overhead bridge cranes with 65.5 ft span; HYSTER H280XL diesel forklift with 26,600 lbs. cap. ; HYSTER H120XM diesel forklift with 11,500 lbs. cap. ; HYSTER S70XL2 LPG forklift; QUINCY (2009) 200hp rotary screw air comp. ; QUINCY 150hp rotary screw air comp. ; REITNOUER 42ft dual axle trailer with 40,000 lbs. cap. ; JC TRAILERS 20ft step deck dual axle trailer with 40,000 lbs. cap. ; DODGE (2008) RAM 1500ST pickup; MAGLINER (2003) portable aluminum yard ramp with 30,000 lbs. cap.,; FREIGHTLINER tractor; ECONOMASTER 18"x80" lathe; TEREX TS30 man lift; RIDGID 1224 power threader; also: mills, grinders, welders, lab equipment, dumping hoppers, chop saws, coil hooks, heavy duty racks, inflammable cabinets, hand carts, strapping caddies, jib cranes, rolling ladders, shop tables, grinders, power washers, floor fans, drill presses, propane heaters, floor scale, pallet racking, portable gantry, sanders, office furniture and equipment and more!